Here for Confidence Creation at Guardian Makeover Fair 2016 at IOI City Mall on Saturday morning. 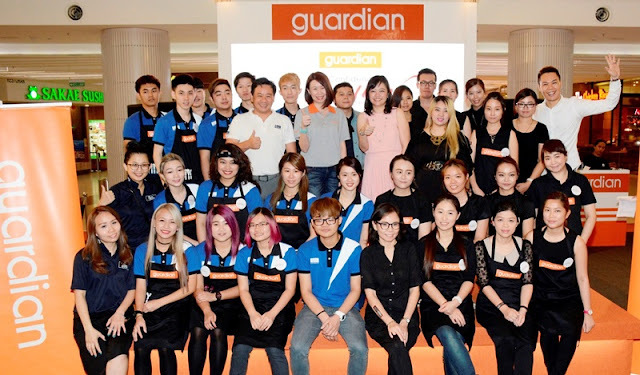 For the first time, Guardian’s annual health and beauty fair is reaching out to women in Peninsular Malaysia over three consecutive weekends at Putrajaya, Johor Bahru and Penang. The event not only gives women a chance to have a makeover and take self-portrait but also empower women with tips and tools to look good and stay healthy. This is the 9th year of Guardian Makeover that started since 2008 as part of Guardian’s continuous efforts to empower women to take charge of their health and well-being. Let’s start! we got our Makeover Ticket each comes with makeup, hair styling, photo print, goody bag and also a RM10 e-store voucher. The makeover is open to anyone with a ticket that comes with the purchase of RM50 of any participating brand. I started with my hair styling styling by A Cut Above, there are a few types for us to choose – fabulous, fun, fancy and fit. I decided to choose the fun type which is quite simple with curls in the bottom. It was quite fast. Then I moved over to do my make-up by Makeup Puzzle, quick touch up, eye shadow and add on my mascara. Tadah I am done and ready for the photo shoot. The whole process took less than 30 minutes from hair to makeup and photo shoot. White is quite fast for me because I only request for a simple hairdo and touch-up my makeup. For those who did the hair braiding and full makeup might take a longer time. It was a quite fun and met quite a few bloggers during the makeover session also. As mentioned earlier Guardian Makeover Fair 2016 will be staged in three towns; the first leg of the fair was held at Johor Bahru last weekend, where thousands participated. The fair will move to Queensbay Mall in Penang from 2-3 April 2016. There are series of events also offer participants a variety of make-up tips to suit different occasions, such as looking fit, fancy, fun and fabulous. Participants who come with family in tow can expect loads of activities at the makeover. Young and matured, male and female are also welcome to enjoy the various activities planned, which include makeup demonstrations and exciting games. All who sign up will go home with a huge goodie bag. Plus, this year Guardian’s Confidence Creation is made merrier with the Missing Hijabi Model search. Casting for new models for Hijabista magazine will be held at all three legs of the fair. You can also check out Guardian’s limited edition tote bag, available at RM19.90 (NP RM49.90) at Guardian stores nationwide, while stocks last. This sounds like an awesome thing to do! I'm now going to google for anything similar in the UK.. would be a great day out with the girls. I love Guardian. Oddly, I purchased a lot of stuff from Guardian when I was in Singapore. They had items that my Mom loved. Lol. Did Guardian just open in Malaysia? I don't remember seeing one when I was in KL. This sounds like it was a truly wonderful day! To have your hair and make up done is great, but to learn the tools to become a better you is awesome! I love events like this that empower women and inspire them to feel better about themselves. It's nice to know that we have these the world over. It seemed like a fun day for everyone, just look at those smiles! Looks like a super fun event. You are stunning as you are. I'm not surprised that it took very less time for your makeover!! This sounds like a great promo that many women will bite. You get to buy good products, and get so many services for free. Learning how to use the tools is great...more like an investment on yourself! Keep shinning as ever. I think any stylist would have an easy time doing a make over with you. You are just pleasantly beautiful. What a fun day! I love that so many people get to participate.